Emmerson Mnangagwa is the president of Zimbabwe, taking over after Robert Mugabe's 37 years in power. Ben Said reports from Harare, as Mnangagwa promises to unite the country and repair the economy. Emmerson Mnangagwa has been sworn in as President of Zimbabwe. He takes over from Robert Mugabe who resigned on Tuesday after 37 years in power. As Ben Said reports from Harare, Mnangagwa promised to unite the country and repair the economy. Robert Mugabe's 37-year-long presidency plunged Zimbabwe into the depths of economic despair. Economist John Robertson explains what Mugabe's successor must do to solve Zimbabwe's economy. After 37 years of rule by Robert Mugabe, Zimbabweans will have a new President on Friday. Emmerson Mnangagwa will be sworn in before tens of thousands at the national stadium in Harare. TRT World's Ben Said is in the capital and takes a look at Mnangagwa, his brutal past and what he needs to do to repair Zimbabwe. 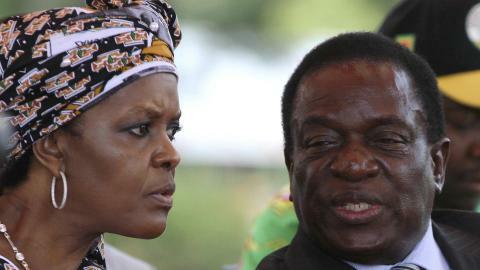 Robert Mugabe and his family may have been granted amnesty for past crimes, but many Zimbabweans will struggle to forgive his wife, Grace Mugabe. Nicknamed 'Gucci Grace' for her lavish spending, the former first lady owns a number of farms in the country. TRT World's Ben Said visited one of them and found people who say they've been harassed by Grace Mugabe for years. People in Zimbabwe are waking up to a new era this morning - one without President Robert Mugabe. An entire generation has known no other leader during Mugabe's 37 years in office. Now there's apprehension, but also optimism for what lies ahead. The former vice president, Emmerson Mnangagwa is expected to arrive in Zimbabwe in the coming hours. The ruling ZANU PF party have said they want to swear him in as president as soon as possible. Caitlin McGee looks at how events unfolded. Zimbabwe's military says Emmerson Mnangagwa, the Vice President sacked by Robert Mugabe, is returning to the country. He's expected to hold talks with President Mugabe who will be the subject of an impeachment motion in parliament in the coming hours. Caitlin McGee reports. Zimbabwe's ruling Zanu-PF party has summoned its MPs to discuss the future of its leader, President Robert Mugabe, after a deadline for his resignation came and went on Monday. How wealthy are the 'poor' Mugabes? The Mugabes say they're poor, but are they really? Here's what we do know about their assets. The Mugabes say they're poor, but are they really? Here's what we do know about their assets. His televised announcement was supposed to end almost a week of unprecedented political wrangling in Zimbabwe - and Robert Mugabe's 37 years in power. Instead, in his first public address since a military takeover, Mugabe refused to step down. And as Caitlin McGee reports, the 93-year-old president now faces impeachment. Ayesha Kajee is a human rights activist and independent political analyst with a special focus on African governance and development. She tracks elections and democratic consolidation in the region. She was on observer in the 2008 Zimbabwean election. President Robert Mugabe has refused to bow down to pressure to resign. The military, his own party, and protesters around the country are calling on him to step down. In his speech to the nation, Mugabe acknowledged there were several 'understandable' issues, but called for a return to normality. The ruling ZANU PF party earlier fired him as leader and says it will bring impeachment proceedings. Arabella Munro reports. Wilf Mbanga is editor of the The Zimbabwean. He joined us live from Johannesburg for this interview about Mugabe's defiance. Professor Dirk Kotze is a Political Scientist at the University of South Africa. He joined us from Pretoria, South Africa. Gervais Lagoke Gnaka is a political analyst specializing in Africa and a Professor of African History at Lincoln University in Pennsylvania. Celebration in the streets of Zimbabwe, as thousands of people welcome the military takeover, and call for President Robert Mugabe to step down. Army chiefs are set to meet Mugabe on Sunday. All of it, part of a bid to end the crisis there. Mark Gay reports. Alex Magaisa is a lecturer in law at the University of Kent and a former adviser to Zimbabwe's ex-Prime Minister and opposition leader Morgan Tsvangirai. interview with Tara O'Connor , CEO, Africa Risk Consulting a consulting company supporting investment across the continent. In Zimbabwe, state media have released pictures of Robert Mugabe meeting the General who led the army takeover on Wednesday. There are unconfirmed reports that Mugabe is resisting attempts to force him to leave the country that he's governed for nearly forty years. Mark Gay has more. Patrick Smith is the editor of Africa Confidential .Founded in 1960, Africa Confidential has a longstanding reputation for original reporting and analysis of key political and security developments across the African continent that goes well beyond what is to be found in ‘open source’ material.